My poor nails have been neglected a bit lately, not too sure why (probably laziness if I'm being honest), so they've not had a manicure for a while and are looking a bit flaky and sorry for themselves. I always find that when they're painted they grow loads and are much stronger too, so I had a good dig around in my little box of nail tricks and pulled out three of my favourite colours. Two are very AW appropriate, my absolute fave being Essie Sole Mate (£7.99). Loved by many, this is a gorgeous rich plum hue that I never get sick off. In fact, I've been known to take it off only to reapply it straight away. I know. Crazy. I think this looks really nice on toes too. Going a little more dramatic, there's also Essie Midnight Cami (£7.99). This gorgeous midnight blue has a teeny bit of shimmer to it and it's especially nice on pale skin so I'm quite a fan. I really like this for the evening as it's a pretty intense colour. I think dark colours look especially good on shortish squoval nails, not sure why that is but it just looks really classy. 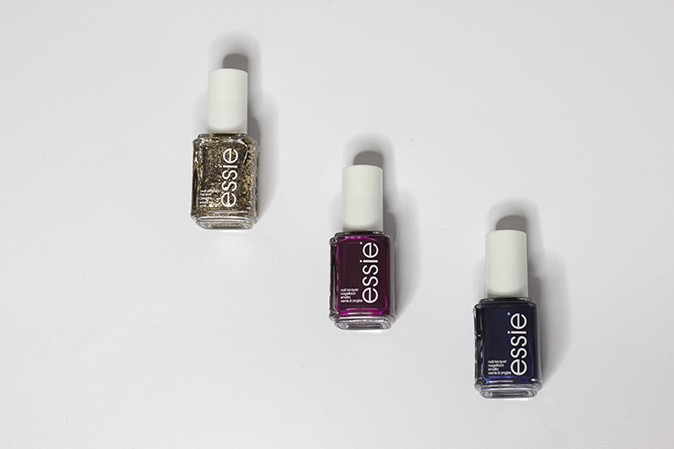 At the complete opposite end of the spectrum is the dazzling Essie Summit of Style (£7.99). This is from Essie's Luxe Collection and it's super special. I haven't actually used it yet but I think it would look gorgeous layered up as an extra sparkly all over number. I'm not the biggest fan of glitter but there's just something about this gold polish that really appealed to me. It has a mixture of large and small pieces of glitter and I can't wait to use it. The only issue now is to decide what one to use! I think it has to be Sole Mate on my fingers and let's go crazy and put a heavy coat of Summit of Style on the toesies to cheer them up! I love the formula of Essie polishes, they apply like a dream and I can get a good week or so out of them before any chips appear. Do you have any favourite Essie polishes that I should be checking out? The post 3 to try from Essie appeared first on Lelore.